I have been sitting around a lot lately and twice now I’ve accidentally clicked on the wordpress app on my phone and found it at the new post screen – so I’m taking that as a sign. I discovered when I logged in this morning that I started this account and posted for the first time in August 2008. I am amazed it’s been 10 years. Life is still rolling along. Lots to update, but I’m doing this with one hand – so keeping it short for now. Most recent news? I injured myself at the gym. I was doing a plank and moved from straight arms to elbows and dislocated (or partially dislocated) my right shoulder on the way down. It hurt, I tried physical therapy for a month and nothing improved – MRI showed a torn labrum (a Bankart tear, to be specific). I had surgery 9 days ago to repair it. I went in for a quick arthroscopic procedure and woke up hours later with a 7″ incision. Turns out I had some stuff going on that couldn’t be repaired without opening me up. So I have the big incision plus the 2 small arthroscopic incisions on the back of my shoulder. I apparently had some loose cartilage in there that was floating around … so that’s gone. I wound up with 4 anchors (securing to the bone). 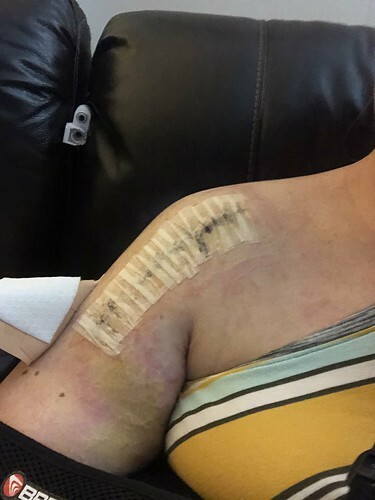 This is definitely unpleasant – but I’m starting to feel better now that I’m off pain meds (except OTC stuff, of course) and am moving around a little more. I remember next to nothing from the first week – except I passed out when I tried to stand up the morning after the nerve block they gave me pre-surgery wore off. That day was rough. It’s been really helpful to read (and watch) the experiences of others who have experienced this (especially when I’m sitting up in pain in the middle of the night), so I will probably post more about the surgery and my recovery sometime soon. In the meantime, I’m at day 9 and I still haven’t slept in my bed and I’ve only been out of my house twice for maybe an hour each time – so yeah. I’m at least at a place now where I can sit without pain for long stretches of time as long as I don’t move, so that’s been a relief. Jon has, of course, been the best caretaker ever. 10 years!! I still enjoy reading 🙂 Hope you are well and back in the gym soon!